Hornworts are a group of bryophytes, or non-vascular plants. The name refers to the elongated horn-like structure, which is the sporophyte. The flattened, green plant body of a hornwort is the gametophyte plant. 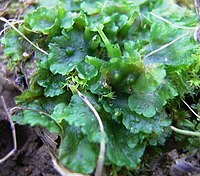 Like all bryophytes, the hornworts have alternation of generations in which the green plant body is a haploid gametophyte, and the sporophyte is the diploid fruiting body. Hornworts may be found world-wide, growing where it is damp or humid. Some species grow in large numbers as tiny weeds in the soil of gardens and cultivated fields. Large tropical species of Dendroceros may be found growing on tree bark. The taxonomy of bryophytes is being debated. Some think the hornworts should be placed in a separate division, the Anthocerotophyta. Horneophyton is a fossil plant similar to hornworts. This page was last changed on 17 December 2018, at 10:19.